Marvel has been hogging most of the comic-book movie news lately, but DC would like to remind you that it’s also been working really hard. In addition to getting into the super-ensemble game with its Batman V. Superman: Dawn Of Justice, DC is finally going to beat Marvel to the movie punch with the villain-centric Suicide Squad. 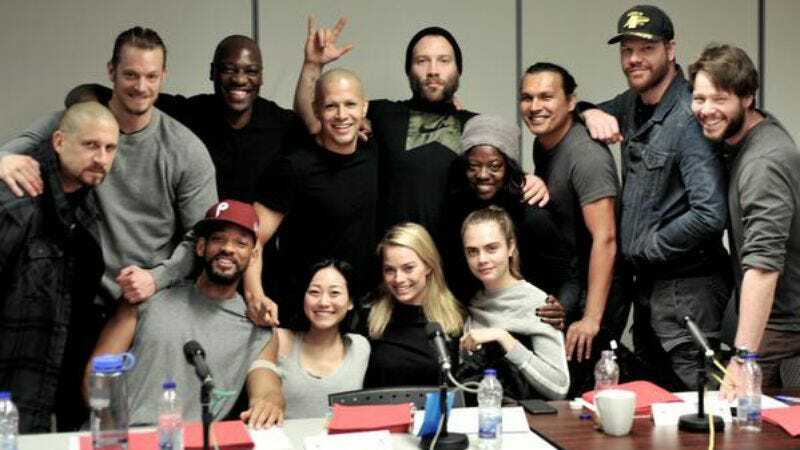 Director David Ayer just tweeted a cast photo that has most of the main stars; we say most because Squad’s Joker, played by Jared Leto, was busy on tour. The guy on the far left, the one who most resembles an actual criminal, is Ayer. He’s joined by Joel Kinnaman, who is playing group leader/special forces badass Rick Flagg. Adewale Akinnuoye-Agbaje, a.k.a. Lost’s Mr. Eko, and Oz’s Adebesi, is going to play Killer Croc. The guy who looks like the Fresh Prince of Bel-Air is Will Smith, a little-known actor tapped to play the marksman Deadshot. Karen Fukuhara and Jay Hernandez have roles yet to be confirmed. Jai Courtney is sporting a beard, and is set to play Captain Boomerang, because DC has all the best villains. Viola Davis is classing up this rag-tag group of baddies as government handler Amanda Waller. Cara Delevingne is playing the Enchantress, a witch with a conflicted moral compass who would benefit from the power of making people forget that Marvel has a movie coming out this spring featuring a witch with a conflicted moral compass. Adam Beach played the Native American who had a hard time in Clint Eastwood’s Flags Of Our Fathers. It’s not yet known who he’ll be playing. As Hoyt on HBO’s True Blood, Jim Parrack spent years getting his emotions toyed with before he finally ran away, making him the perfect proxy for the audience. He’s rumored to be playing Deathstroke, a super assassin who is not Deadshot, because that’s Will Smith. Finally, Ike Barinholtz will use his Mindy Project charms (and hopefully some of his Eastbound & Down attitude) to possibly play Gotham shrink Hugo Strange.